Central Arizona juniors put in a strong showing at the level-3 national Dunlop Junior Championships. held Oct. 9-12 at the Rancho Las Palmas Resort in Palm Desert, Calif. 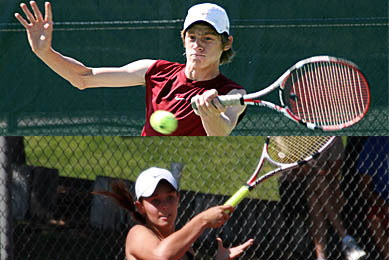 The mixed doubles duo of Courtney Amos (Tucson, Ariz.) and Alex Lawson (Tempe, Ariz.) - both pictured, right - were the only USTA Southwest titlists at the event, but many other juniors reached the latter stages of the tournament. Amos and Lawson swept through four rounds, including a final-round victory over the top seeds Hudson Barnhart (Wenatchee, Wash.) and Sophia Bott (San Clemente, Calif.) 9-7 in the final. - Top-seeded Madison Clarke (Phoenix, Ariz.) won five rounds and reached the Girls 14s finals before falling to Amber Park (La Canada, Calif.) 6-0, 6-7, 10-5. - Nathan Ponwith (Scottsdale, Ariz.) reached the Boys 14s semifinals as an unseeded player, playing up an age division. Ponwith took out three seeds (the 3, 13 and 9) in succession before falling to top-seeded and eventual winner, Ernesto Escobedo (West Covina, Calif.). For complete results from the Dunlop Junior Championships, click HERE.